There was some confusion down on the tennis court below. It was late afternoon -- August 1983, a few days after Phanindra had received his name. The afternoon function had been cancelled, so I went and hung out at the tennis court hoping that Guru might drop in. He did, and there weren't many people there. I quickly took a seat in the gallery overlooking the court and began meditating. Guru wasn't playing yet, though. He was talking to a couple of disciples who were down on the court itself, who had the privilege of serving him directly. They, however, appeared confused about what Guru wanted. They kept looking up to the gallery and then back at Guru, not understanding. So, Guru took matters into his own hands. "You there," he called. "You, from San Jose, what's your name?" Oh my God, he was talking to me! "I've forgotten your name," Guru called out again pointing towards me in the gallery. "Joe," I called back, with my hands folded, prayer-like, in front of me. "Joe. Joe, would you like to be a ball boy? Please, come down." I immediately vaulted over the gallery wall to the tennis court five feet below. The court itself was made of green clay. The other ball "boys" were Ketan (16), his younger sister Jayanti (about 12 or 13), and another young boy named Bishwas (who must have been about 12 or so). I didn't know any of them personally, nor did I know what I was supposed to do. The kids were all barefoot, so I started by taking my shoes off, too. The clay court was cool, having just been watered to cut down on dust. And then Guru started playing. I was in heaven. Guru had not only spoken to me, but had given me a job serving him. On top of that, he had put me in with a group of kids, all of whom had grown up in the Center. Now, I knew from whence I came. I hadn't forgotten what debauchery I had been capable of just a few short years before, so I had no illusions about being a kid untouched by the world (as I viewed my fellow tennis ball chasers). But it felt fantastic to be thrown among them; to be seen by the other disciples in the gallery as one of the kids. As my brother remarked years later: "You were a made man." Being a ball boy itself wasn't hard, just a lot sprinting back and forth across the court shagging balls. 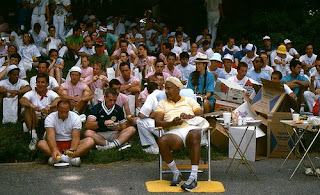 The highlight, though, was tossing tennis balls to Guru during his service games. He'd hold out his hand and expect the ball to land in it directly on one bounce. It was easy and it was profound -- for the first time I was establishing a personal connection to Guru. As a "made man," I was also immediately accepted by a small cadre of other disciples who lived in New York and whose day jobs consisted of rendering personal service to Guru. The first, most significant, and longest lasting of these new friends was my fellow ball boy Ketan, who at 16 was just two years younger than me. The photo above is one of the great shots taken by former Paris disciple Subala, whose other fine shots can be seen here. Hey, isn't that one pf the pictures I put on my Flickr album? You can use others if you like. Yes! So sorry for not crediting you properly. In some of my early posts like this one, I had just put a link on the photo itself, so that when it's clicked on it brings the viewer to the source -- in this case, your beautiful photo album on Flckr. I later changed that by trying to always give an explicit credit, and I've gone back and added that. Sorry again. For those of you who haven't yet looked at Patricia's photos from back in the day, take a moment and do so. The can be seen here.